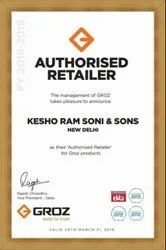 Established in the year 1969, Kesho Ram Soni & Sons is the leading Exporter of DRILLING, MINING AND INDUSTRIAL TOOLS & EQUIPMENT to customers across the globe. Immensely acclaimed in the industry owing to their preciseness, these are presented by us in standard and modified forms to our clients. Presented by us in various provisions, these are inspected sternly to retain their optimum quality. Under the administration of Mr. Aditya Soni, we have garnered a reputed position in this highly competitive industry. We have a team of creatively talented professionals from the different fields who are hardworking and up to date in terms of market research and technologies. Our team is highly qualified and trained having years of experience in their respective domains. They help us to deliver our precision engineered range to our clients as per the specifications detailed and to meet their requirements in a better way. The team is segregated in various departments as per their qualification and years of experience. Further, all our departments work in close coordination with each other to achieve the desired goals and fast and smooth functioning. With quality as our forte, we offer a wide range of drilling, mining and other industrial equipment to our reputed clients from variegated industry segments. Our range of products is greatly admired and appreciated by our clients for its superior quality, durability and corrosion resistance features.